The books of reference used for this study of the book of Luke were the Bible, King James Version, called "The Companion Bible", Publisher Kregel; Strong's Exhaustive Concordance of the Bible, numbered to the Hebrew, Chaldee, and Greek, and English, coded to the Strong's Concordance numbers. "John's Conception. [5 - 25]"
"The Holy Family. [ 26 - 56]"
"Visit of Gabriel to Mary. [ 26 - 38]"
"Visit of Mary to Elisabeth. [ 39 - 56]"
"The Blessing of Mary. [ 41 - 45]"
"Hymn of Mary. [ 46 - 55]"
"Favors to herself. [ 46 - 49]"
"John's Birth and Circumcision. [ 59 - 63]"
"Zacharias. Prophecy: Fulfilled and Renewed. 64 - 79]"
"Angelic Message; Attestations. [ 8 - 15]"
"Angels Message. The Good News. [10 - 12]"
"Praise of Shepherds. [14- 20]"
"Earthly Testimony. [25 - 38]"
In Galilee and Nazareth. [39 - 52]"
"The Forerunner [1 - 20]." "John's Proclamation [7 - 18]." "The Baptism; with Water. Divine Genealogy 21 - 22]." "The Age of the Lord ." "Human Genealogy of the Lord [23 - 38]." "The Temptation of the Lord. [1 - 14]"
"The Lord's four fold ministry; Proclamation of the Kingdom. [14 - 30]"
"Proclamation from the Prophecy read from Isaiah 58:6. [15 - 27]"
"Prophecy application. [23 - 27]"
"Miracles at Capernaum. Jesus rebuked the demonic. 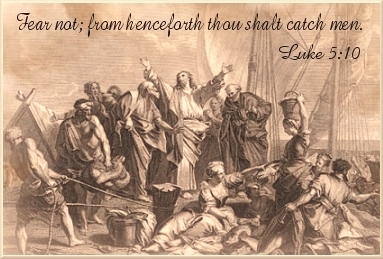 [31 - 44]"
Jesus taught the people from the ship. [1 - 11]"
"Cleansing of the Leper. [12 - 26]"
"Disciples. Call of Levi. [27 - 29]"
"Parable of the Wine Skin. [34 - 39]"
"Tour. Sabbaths. [1 - 11]"
"Disciples. Call of the Twelve. [12 - 16]"
"Tour. Healing and Teaching. [17 - 49]"
"Centurion's Servant Healed. [1 - 10]"
"The Widow's Son Raised. [11 - 17]"
"John's Second Mission, Concerning the Lord. [18 - 23]"
"Jesus' Testimony Concerning John. [24 - 35]"
"Concerning the Pharisees. [36 - 50]"
"Christ's Teaching. [1 - 21]"
"Parable of the Sower. [4 - 18]"
"Two Miracles: The Tempest Stilled. [22 - 26]"
"The Demonics. [27 - 39]"
"Two Miracles: Healing of Jairus' Daughter. [41 - 48]"
"Jesus Raising Dead Woman. [49 - 55]"
"Mission of the Twelve Disciples, and Return. [1 - 10]"
"Miracle, and Feeding of the Five Thousand. [10 - 17"
"Disciples. Confession of Messiah. [18 - 21]"
"Jesus Announcement of Sufferings to Disciples. [22 - 36]"
"Start of Christ Third Period of His Ministry. [verse 22]"
"Jesus Healing of the Lunatic Son. [37 - 43]"
"Jesus Instructs Disciples in Humility. [46 - 48"
"Instruction in Fellowship, John. [49 - 50]"
"Instruction in Forbearance. [51 - 56]"
"Joy of the Seventy. [17-20]"
"Joy of the Lord. [20-24]"
"First Demand of the Lawyer. [25-28]"
"Second Demand of the Lawyer. [29-37]"
"Martha. Her Colloquy with the Lord. [40-42]"
"Request, Complied with. Parable. [5-13]"
"Lord's Answer to Their Thoughts, Divided Kingdom. [14-26]"
"Signification. the Son of Man. 30-32]"
"Lord's Answer to the Pharisee. Woe to Self-deception. Concealed Wickedness. Woe to Pride. Uppermost Seats. Woe to Self Deception. Concealed Defilement. [39-44]"
"The Lord's Answer to the Lawyer. [46-52]"
"Jesus Christ's Address to His disciples. [1 - 12]"
"Jesus' Address to the People. [13 - 21]"
"Solicitude. Discouraged. [22 - 31]"
"Liberality. Encouraged. [32 - 34]"
"Watchfulness for the Lord. (Positive) [35 - 53]"
"Deliverance. Diligence. [54 - 59]"
"The Evil Generation. [1 - 5]"
"Parable of the Fig Tree. [6 - 9]"
"Synagogue Miracle. [10 - 17]"
"The Kingdom. Likeness. [18 - 21]"
"Entrance Into the Kingdom. [22 - 35]"
"Individual Entrance. [23 - 30]"
"The King. Personal Departure. [31 - 33]"
"Pharisee's House. [1 - 24]"
"Marriage Feast. Miracle. [7 - 11]"
"Teaching. Dinner guests. [12 - 14]"
"Parable of the Great Supper. First Guests. [15 - 24]"
"Parable Teaching on Discipleship. [25 - 35]"
"Parable of the Lost Sheep. [3 - 6]"
"Parable of the Lost Drachmas. [7 - 9]"
"Parable of the Two Sons, Prodigal Son. [11 - 24]"
"The Brother's Anger. [25 - 32]"
"Parable. THE UNJUST STEWARD. [1 - 8]"
"Application: Mammon. [8 - 12]"
"What the Pharisees Taught. [18 - 30]"
"Address to Disciples; Stumbling-Blocks. [1 - 4]"
"Faith and Duty. [5 - 10]"
"Journey. The Healing of the Ten Lepers. [11 - 19]"
"The Kingdom Nigh. [20 -24]"
"The Coming Kingdom, Suddenness. [26 - 37]"
"Parable: The Unjust Judge, Righteous Vindication. [1-8]"
"Parable: Pharisee and Publican. Righteous Justification. 9-14]"
"Character, Example: Infants Brought. [15--16]"
"Rewards of the Kingdom. [28-30]"
"THE FOURTH PERIOD OF JESUS MINISTRY. THE REJECTION OF THE KINGDOM." "Calling of Zacchaeus. [2 - 10]"
"Mission of the two Disciples. Bring the Colt. [29 - 35]"
"Jesus Entering upon the Mount of Olives, the Multitude. [35 - 44]"
"In Jerusalem. COMMISERATION. [41 - 44]"
"THE ENEMY. First Attack: AUTHORITY. [1 - 8]"
"Parable Against the First Enemy. [9 -18]"
"THE ENEMY. Second Attack: TRIBUTE MONEY. [19 - 36]"
THE ENEMY: Third Attack: RESURRECTION. [27 - 40]"
"THE DILEMMA FOR THE ENEMY. [41 - 47]"
"Event. The Poor Wwidow. [1 - 4]"
"Prophetic Discourse. [5 - 36]"
"The Lord's Warning. [5 - 6]"
"Prophecy, End is Not Yet. [9 - 24]"
"The Great Tribulation, the Last Things. [25 - 26]"
"The Fig Tree. [27 - 31]"
"Last Warnings to the Elect. [32 - 38]"
"Event: The Last Passover. [1 - 38]"
"The Feast, Nigh. [1 - 7]"
"The Feast Prepared. [8 - 13]"
"The Feast Partaken, Communion. [8 - 20]"
"Jesus Prayer of Agony. [39 - 46]"
"Jesus Betrayal by Judas. [47 - 54]"
"Jesus Brought to Trial: Peters Denial. [55 - 62]"
"Jesus Led Away to the Sanhedrin. [63 - 71]"
"Jesus Christ Lead to Trial. [1 - 23]"
"Examination Before Herod. [8 - 11]"
"Compromise Proposed. [13 - 23]"
"Led Away to Death. [26-32]"
"Conspiracy Completed. [33 - 49]"
"Our Lord's Bruial. [50 - 56]"
"The RESURRECTION. [1 - 12]"
"Journey to Emmaus. [13 - 32]"
"THE LORD'S INSTRUCTION. [17 - 27]"
"Return to Jerusalem. [33 - 49]"
"The Lord's Words [36 - 49]"
"Post Ministerial. [50 - 53]"